Probably it was the concept behind the OMC140 carbon tube, but as far I remember there were complains about "thermal bridges" originating from the rear cell. "Who's going to be the first to put there scope in a bucket and shoot the periphery with expanding foam?" Not me but it may be worth doing. Good idea! Edited by Richard O'Neill, 15 January 2018 - 12:48 PM. "I wonder if Yuri changed the fans or improved this in later models? I believe you have early ones? In my 8" TEC the fan works really well (for my climate) think its a single unit? Mine was built in 1999/2000 if I remember right. I also think the quartz mirrors helps give good views in falling temps. Here in Florida most of the year cool-down is not an issue, though in the winter it can be, so I keep my OTA in the wine cellar at 48 degrees until the sun no longer shines on the mount if its going to be cold." These fans may or may not be identical from scope to scope over 20 year manufacturing period but when it comes to size and distance from the metal tube they are about the same, they are just too small to move enough volume of air to be effective in larger models, so the way that I see with 8” and 10” models, with the fans on or off, the cooling remains primarily passive and that takes a long time, my 10” generally never reaches thermal equilibrium even if it is left outdoors all night. I am going install a closed loop internal recirculating air system for the 10” complete with internally insulated tube, this avoids introduction of moisture and dust into the tube, it will be a major modification, I plan on using an external air pump to set the entire volume of air in constant motion, we shall see how it performs when it is all said and done. The 200/20 is from 2002, mine is the very last model produced by TEC, Yuri stopped making super planetary f/20 versions due to higher demand for your f/15.5 model. And, no I have not placed any insulation on the backside of 200/20. As for mirror substrate, quartz, Astrosital or even pyrex, I do not believe that it makes all much difference since the primary is inside a closed tube and any heat that it sheds remains inside the tube, the only way to take advantage of quartz and its rapid heat transfer properties is to consider an open back design where the primary is allowed to discharge its stored heat directly to the outside, something similar to AP Mak. Who's going to be the first to put there scope in a bucket and shoot the periphery with expanding foam? Permanently installed Reflectix insulation (technically a radiant barrier) works well on my C8. This scope was a testbed to evaluate the idea. I also have a 7" Mak. that is completely surrounded with this material. As a consequence the radiation barrier allows observations to begin immediately and dew is no longer a problem. What's not to like? I started with a 24" x 25 foot roll of double reflective Reflectix, obtained from Home Depot. A portion of the roll was wrapped around the C-8 and marked for cutting, allowing a tiny bit more for later trimming if needed. Since it came as a roll it had a preformed curvature which made it easy to wrap around the tube and temporarily hold in place with painters tape to mark for trimming. The 24" length completely covers the tube (one layer only) starting at the primary mirror cell and extending about 11.5+ inches beyond the end of the tube to serve as a dew shield. The Reflectix is held in place by friction and the dovetail plate attachments. The full length of the seam is snugly secured using a long strip of Nashua 322 HVAC multi-purpose foil tape. Following completion a dovetail plate was attached using previously marked screw points. A single pinprick allows the screws to engage the scope's threaded holes. To avoid crushing the foil underneath the dovetail plate ends I marked and minimally cut away the footprint before finally securing the insulation with tape. While it's true that the metal to metal contact does present heat transfer points on the tube the area affected was judged to be insignificant. Plenty good enough for government work. That's about it except to note that the fragile nature of the covering requires care in handling. A large plastic trash bag covers the entire instrument when not in use. One of these days I'll get around to covering the rear cell but as a testbed I'm happy with its performance as is. BTW, the dovetail plate is for use on a GEM mount when I desire the convenience of GOTO with this scope. Edited by Richard O'Neill, 15 January 2018 - 06:52 PM. "As the night wears down and the air cools even further, it's important that the telescope's optics keep up with the changes and not be insulated." I believe the idea is to have the scope thermally stable at whatever temperature it is, to the extent possible. It does not have jive with the local ambient, as yelobeard mentioned above, it just has to be stable so no temperature gradient forms inside the tube. Such a gradient has different density and density has different refractive properties causing problems much like atmospheric seeing. Especially when the gradient is in motion, and it will be in motion as less dense warm air tends to rise inside the tube. I joke to illustrate the idea by saying you can view through a scope when the temperature is either a plasma or a block of ice, so long as the density is uniform and the air inside the OTA is stable...at any temperature. Same with hurricane force winds, so long as they are uniform in density. There are scopes mounted on aircraft blowing through the atmosphere at 600 knots. The idea of insulation is to reduce the tendency for the scope to cool by passive radiation to the sky suppressing the formation of any temperature or density gradient. It can retain its own ambient heat and still perform, even in sub zero temperatures. The key is stability, not temperature. This is what we achieve when we cool to ambient, we achieve thermal stability. My only concern with this method is the corrector or meniscus. It is exposed to the sky and will cool. So, it seems a temperature gradient will form, regardless. I have no idea how much of a problem this might be. Edited by Asbytec, 15 January 2018 - 07:24 PM. Many insulated scopes already proved it not to be a problem, as long as you still use a dew shield to protect the corrector as much as possible from that cold radiation from the sky. And glass also still has a certain amount of insulation power, which means that the outside temperature is not 'immediately' transported inside your scope. Corrector thickness is a factor, with of course thicker correctors (in MCT's) theoretically giving better insulation. But that said, my 16" SCT has a corrector 'thinness' of only 5.7mm (some 0.22") and even that seems to not give problems, and we sometimes have quite a big temperature difference here I can tell. My 16"SCT originally had a 7.7mm thick corrector, but i could not stay away from that ultimate challenge to try a 5.7mm, think of what a 16" MCT meniscus will weigh, having a thickness of what? Some 1.5 inch?? Ish...? Edited by yellobeard, 15 January 2018 - 11:43 PM. Our Home Depot doesn't carry Reflectix. Not much call for it in Hawaii, I guess. My wife ordered a role from Amazon to pad out an order to get free shipping. It should be a fun experiment. Beard, great. A dew shield is part of the solution. Makes sense, really, that's their function. I have plenty of Reflectix available and lying around. I only have a NexStar 6SE. Given it's a smaller scope, yet still an SCT, would it benefit from using an insulating wrap? My temperature fluctuations can vary greatly. My home is about 69*F indoors, but during the winter it can get well below zero outdoors. I do have an unheated, enclosed porch I can store the OTA where the temp differences are not so great before taking it outside (although I don't go out in temps much below 30*F anyway). If it would help to wrap the the OTA, does it make much difference if there are gaps in the insulating material? I have my scope mounted in some tight fitting rings with finders and a dew controller attached to the rings so there is no way to wrap the entire OTA. Would I lose too much if I only wrapped the OTA in front and behind the rings? I can't wrap it and still get the mounting rings around it. I also have a dew shield and a heated dew strap for the corrector. I won't even bother if it doesn't matter much for a small scope like the 6SE, or if the gap where the rings are makes the insulation essentially worthless (like losing heat where the rings are). I'm off to Ace Hardware. I'm wondering about the same. Have a C6 (6SE specifically) too, and if insulated and mounted on a Twilight 1 for example, could be a really great 'grab and go' right out of the house. No waiting for even a short time for it to acclimate to the typical 40 degree change sometimes here in the winter. Edited by spongebob@55, 16 January 2018 - 11:21 AM. FWIW, I have the AP 10" Mak and it's thermal control takes the opposite approach. The fans blow outdoor air on the back of the primary mirror so it cools to ambient in minutes. The substrate is quartz so the figure doesn't change as the temperature of the mirror changes. All the edges of the mirror are ground to take the "skin" off so it won't pretzel as it cools. The only thermal problem is the meniscus, even with the dew shield and dew straps on it the meniscus cools too fast, too far, and becomes a dew magnet. Bubble wrap around the dew shield and meniscus cell solved that (suggested by Roland Christen). Certainly in situations that involve a big difference in temperature, It is very recommended to insulate even the smaller scopes, certainly SCT's.. Between the "gaps" there is enough area to be insulated, if only to reflect the cold radiation from the sky. So if I were to make a wraps to go around the OTA behind and in front of the rings, should I then cut pieces out of the Relfectix material to "fill-in" over the open areas of the rings? It would be easy enough to use velcro to easily affix the back and front pieces where they overlap around the OTA, and also for the small pieces over the rings (which could overlap the front and back pieces). Yes, reflecting the cold radiation always is a good idea, also over the open areas of the rings.. I often use a C6 too, on which insulation makes a big difference..
Edited by yellobeard, 16 January 2018 - 11:56 AM. I'll have to give it a try. My enclosed, unheated entryway porch is an ideal place to store my OTA as it is almost always fairly close to the outdoor temps. If I wrapped it as much as possible and kept it stored at close to the outdoor temps, I should be able to use the scope pretty much immediately without waiting for cool-down then, correct? Keeping it on the porch obviously helps to cool down your scope, but it is not needed. Like I wrote before: With proper insulation, you don't need to cool down your scope, as the insulation drasticly slows down the internal cooling, all ingredients allow themselves to easily follow the slow gradual drop in temperature, preventing nasty gradients, that normally would cause deformations in optics and turbulence in internal air. And.. Warmer internals also at least slows down the tendency of dew forming on that corrector plate. But you still need a dew shield to prevent most of the cold radiation to get a hold on that corrector, in which way, you can enjoy the benefits of insulation for much longer. Edited by yellobeard, 16 January 2018 - 12:19 PM. It's really been an enlightening thread to read. It appears that stabilization is more important than equalization. Especially when considering that at any point in time where the inside is equal to the outside, it is more likely to be temporary at best anyway because the outside temps could still continue to drop, leaving one forever chasing after that elusive equalization. Edited by MarkMittlesteadt, 16 January 2018 - 12:54 PM. I did this more than a year ago and it worked great for getting rid of the flumes and tube currents. I sold the 6" ACF recently but the Reflectix shield is still in the garage and the flat black paint for the lens shield part that extends past the scope is still looking great. I used simple clear packaging tape to hold the shield on and this turned out to be very useful for when I removed and reinstalled it as it just peeled off months later. 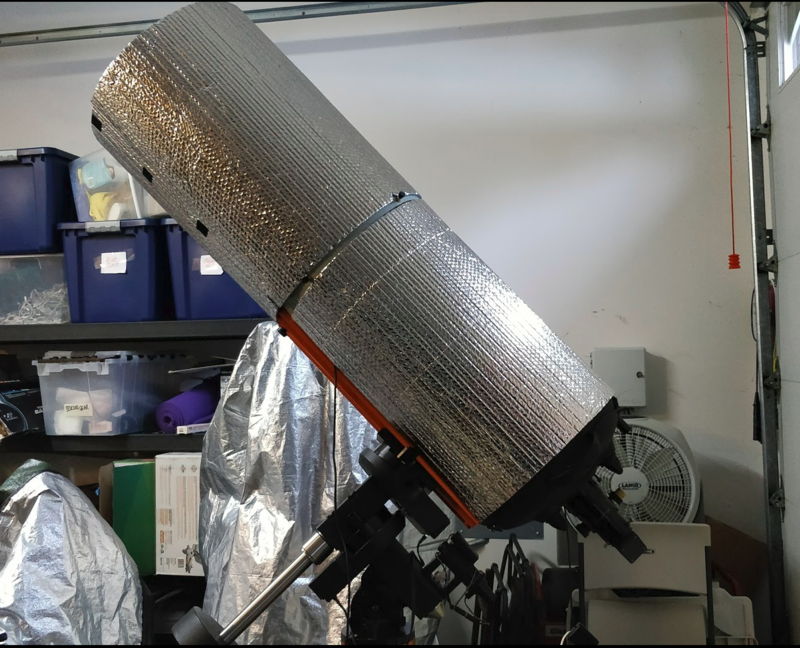 One of the top planetary imagers from 'down-under' in the planetary imaging forum frequently mentions insulating and even using ice-packs on his SCT. I suggest you look in that forum for further info and details. Here's my C14HD. This is the only way it has a prayer at showing an Airy disk. Reflectix and Velcro is a cheap expense. If it doesn't work, no harm done. Another quick question...when wrapping the OTA in Reflectix, does the material cover the heated dew strap around the corrector, or should the insulation only come up the the edge of the dew strap? I have a heated dew strap right behind the corrector on mine and I'm curious if that affects how to insulate the OTA. In the pic below, you can see the dew strap just behind the existing dew shield. The dew strap is right up behind the corrector holder with the dew shield wrapped around the holder. I am planning on doing the exact same thing to my C14. The only difference is that I will be using a 48" wide roll of Reflectix. I can then cut a single piece that integrates both the OTA insulation and dew shield. This should make the dew shield pretty wind resistant and not prone to slipping.